Aser Aspire combines average ultrabook-like performance and looks with pocket-friendly price. ince laptops and tablets will get closer and closer after Windows 8’s official release so get used to seeing laptops with touch screen displays. In this video review you will see such a machine introduced by Acer – this is Aspire V5 Touch laptop. This Windows 8 laptop comes in elegant and clean matte silver plastic case. It very much reminds us of what an ultrabook looks like but the V5’s specifications does not completely match Intel’s requirements for this title. 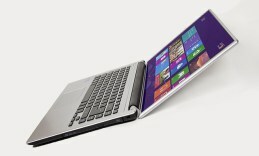 But it stands very close to ultrabooks only at a much lower price. My first impression from this laptop was its weight of 2.2kg, a little heavier that what it looks like as it’s relatively slim. Under the lid we find a full-size island-style keyboard. The black keys have a short stroke and work very quietly even when typing fast since they feel soft. You are very much facilitated by the backlight of the keys. The button touchpad below is big enough to provide enough surface for all gesture controls like two-finger scroll, pinch, rotate, flip, swipe to initiate commands and access all the applications. The performance depends completely on the hardware so let’s take a look inside the case of Aspire V5 touch. Opening the lid we find a 14’’ HD Cine Crystal LED sensor display supports 10-finger touch gestures that provide control over all the processes. The visual performance is supported by Intel HD graphics 4000. The sensor technology on the screen is well-responsive and gives you quick access to the web and multiple applications through Windows 8 tile interface. Our test configuration came with a dual core Intel core i3 CPU with 3M smart cache at the working frequency of 1.4GHz.The machine definitely did not perform as fast as we would expected. But you can find the V5 in a configuration that features the faster and more productive IntelCore i5 CPU while at the same time keeping the rest of the specifications the same but even then don’t expect miracles. The RAM on board is 8GB DDR3. The hard drive storage offers 500 GB SATA HDD user memory. The connection technologies here include Bluetooth 4.0, 2USB ports 2.0 and 1 USB v3.0., an HDMI port with HDCP support, a Multi-in-1 card reader. The Dolby Advanced Audio v2 technology delivers an enhanced sound quality at a pretty high volume level. There is an optical drive DVD super multi on board. The 4-cell li-ion battery inside the Aspire V5 has 2500mAh capacity. It lasts for about 5 hours when browsing on Wi-Fi – it falls a little behind the average battery life of most competition machines. The Acer Aspire V5 touch comes with the brand new Windows 8 Home Premium platform.